Home > Guides > How to e-verify Income Tax Return? 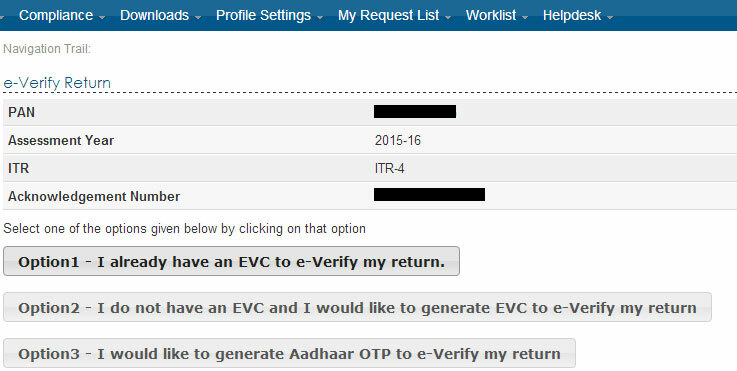 No need to send ITR-V to CPC, Bangalore if you are using electronic verification to verify income tax returns. In a bid to provide taxpayers much needed ease in verifying the e-filing of Income Tax Returns, Income Tax Department has rolled out electronic verification for e-filing of Income Tax Return following which there is no need for taxpayer to send ITR-V to CPC, Bangalore for e-filing verification. The new system of electronic verification is applicable from FY 2014-15 or AY 2015-16. Now, let’s discuss all the above-mentioned ways to electronically verify e-filing in detail. Step 2: Now, navigate to “e-file” menu and click on “Generate EVC” as shown in Figure 6 and 7. Step 3: Click on ‘e-Verify’ link to e-Verify the return (Figure 8). Now, the taxpayer will see three options as given in Figure 9 if he has already filed the return and the same has not been verified yet. Step 5: Enter the EVC that you received on your mobile number and email ID in the provided text box and click “Submit” (Figure 10). A message will be displayed on the screen showing the successful e-verification as given in Figure 11 below. You can download the attachment which has also been sent to your registered email id and no further action is required. 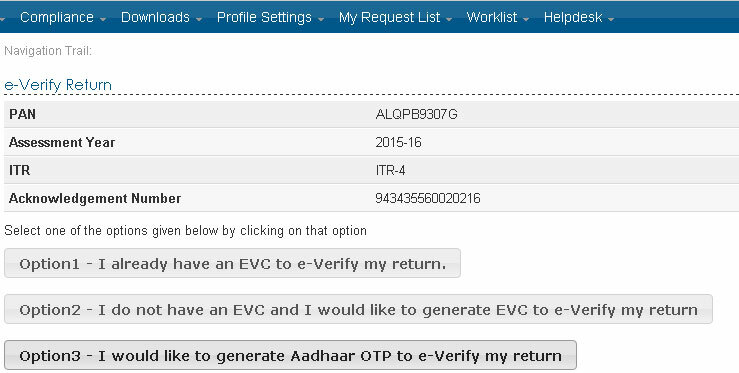 Step 5: Click on ‘e-Verify’ link to e-Verify the return as per Figure 12. Now, you will see three options as given in Figure 13 if you have already filed the return and the same has not been verified yet. Step 7: Now, enter the EVC that you received through Bank ATM and click ‘Submit’ (Figure 14). Step 8: You will see success message as shown in Figure 15. Now, download the acknowledgement. Step 3: Fill the required details viz. Bank Account Number, IFSC, Email ID and Mobile Number as given in Figure 16.